Supporters of plans to build an arena and sports performance complex at Coralvilles Iowa River Landing made a pitch Thursday for $12 million in state assistance, but drew opposition from Cedar Rapids tourism officials who said it would create too much competition between venues too close together. The Coralville project is one of five statewide that made the finalists cut to compete for state economic development assistance. Together, the projects are seeking about $65 million in help  but theres only $41.5 million in available state funding. A committee now will vet the projects and recommend to the Economic Development Authority which to support. The board has until June 30 to decide. The Iowa River Landing project is estimated to cost $185.3 million overall and include a 7,000-set arena, hotel rooms, retail and residential uses and a fitness and sports performance center. City officials said the overwhelming majority of the cost would come from private sources. During their presentation, Coralville officials showed the board a dramatic video animation. It depicted a glass exterior of a building with the words Iowa Arena across the top. Inside, the animation featured a hockey game full of cheering fans. The arena would sit in a bowl similar to Carver Hawkeye Arena, according to Josh Schamberger, president of the Iowa City/Coralville Area Convention and Visitors Bureau. Of the $12 million in state assistance requested for the entire project, $10 million would go toward the arena, according to figures presented the board Thursday. Coralville City Administrator Kelly Hayworth said if all the funding comes through, the new arena could break ground in 2016. About two years ago, Cedar Rapids built and opened its new convention center and renovated its antiquated arena next door and what had been a bankrupt hotel connected to the arena. That $146 million project came with the help of federal and state funds, but needs ongoing local tax support to help pay $77 million in outstanding debt and about $400,000 in the upcoming year to help with operating costs at the arena and convention center, according to city budget figures. Cedar Rapids officials worry that building a similarly sized arena just down Interstate 380 about 25 miles away would take business away from their arena. The Coralville project was the only one of the five pitched Thursday that drew opposition from the public at the meeting. But Coralville officials insist there are plenty of entertainment options to go around. This project has been in our master plans for almost two decades now, Coralville Mayor John Lundell said.  An outdoor tournament center, wave simulator and hotels in Davenport.  An agriculture and expo learning center, new convention center hotel and downtown lofts in Sioux City. 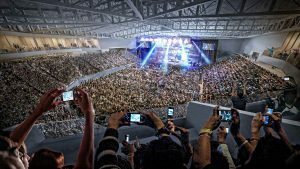  A multipurpose arena, performing arts pavilion, hotel and downtown parking garage in Mason City.  And a hotel and convention center plus enhancements to Grinnell College and downtown Grinnell. The projects are competing for funds in the states Reinvestment District Program, which reinvests hotel and motel sales tax into economic development projects. Erin Murphy of The Gazette-Lee Des Moines Bureau contributed to this report.